Men of the Nigeria Immigration Service have arrested the Senator representing Kogi West Senatorial District in the National Assembly, Senator Dino Melaye. 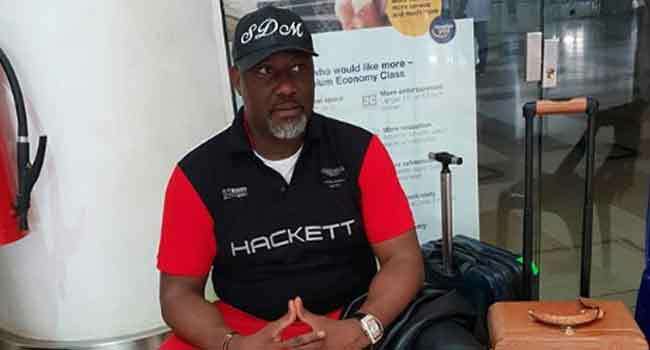 Senator Melaye was on Monday arrested at the Nnamdi Azikiwe International airport Abuja on his way to Morocco. His arrest may not be unconnected to his refusal to report at the Force Headquarters in Kogi for questioning. Melaye took to Twitter to announce his arrest. “I have just been arrested at the international wing of the Nnamdi Azikiwe airport on my way to Morocco for an official engagement sponsored by the Federal Govt after checking in,” he said on Twitter. I have just been arrested at the international wing of the Nnamdi Azikiwe airport on my way to Morocco for an official engagement sponsored by the Federal Govt after checking in. But the lawmaker failed to honour the invitation and a court summon issued him by the Force on March 24. According to the police, the Senator is wanted on grounds of criminal offences of conspiracy and unlawful possession of prohibited firearms. Melaye’s summon follows the arrest of two men in Dekina Local Government Area of Kogi State, on January 19, after they confessed to having committed various crimes such as kidnappings and armed robbery. The police while parading Kabiru Seidu and five other suspects who escaped from a detention facility in Lokoja, said it is in the interest of Senator Melaye to voluntarily report to the Police in order to forestall the execution of an arrest warrant issued against him. Force Public Relations Officer, ACP Jimoh Moshood, explained that the suspects whose confession indicted Senator Melaye and Mohammed Audu as sponsors of thuggery in Kogi will be arraigned before a Federal High Court in Lokoja on May 10, 2018.